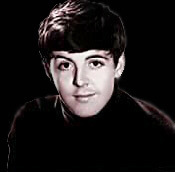 On June 18, 1942, James Paul McCartney was born at Walton General Hospital in Liverpool. His brother, Michael, who's full name is Peter Michael McCartney, and who later went by the name of Mike McGear, was born two years later. His family moved a few times, when he was 13, they moved to 20 Forthlin Road in Allerton, just across a golf course and a little over one mile away from where John lived with his Aunt Mimi. His mother Mary died of breast cancer when he was fourteen, while the two brothers were away at Boy Scout camp. Before the war, Paul's father was a Cotton salesman during the day, and a jazz musician with Jim Mac's Jazz Band by night. The antithesis of John, Paul did very well in school. When Lonnie Donnegan appeared in Liverpool and the Skiffle craze hit, Jim McCartney scraped together £15 for a guitar for Paul. Paul's friend Ivan Vaughan invited Paul to Woolton to see the Quarrymen play in Woolton on July 6, 1957, but not really to hear the Quarrymen, it was because Vaughan had promised Paul it would be a great place to pick up girls, which Paul was already very interested in at the age of 14. Later in the afternoon, after hearing the Quarrymen play, Paul borrowed a guitar and impressed the boys with all the chords and the words to "Twenty Flight Rock". Paul's first impression of John was that he was drunk. But Paul wrote down the words for "Twenty Flight Rock" and "Be Bop a Lula" for him so that John could learn them. A few days later Pete Shotten told Paul the others wanted him to join the band. "We've already bought all our dreams. We want to share that possibility with others. When we were touring, and when the adoration and hysteria were at a peak, if we'd been the shrewd operators we were often made out to be, we might have thought -- that's nice! Ah. Click. Let's use this for own evil ends. But there's no desire in any of our heads to take over the world. That was Hitler. That's what he wanted to do. There is, however, a desire to get power in order to use it for good." "I realize now that taking drugs was like taking an aspirin without having a headache." Imagine Your Dream... photo exhibition - click here!